In honeys, several molecules have been known for their antibacterial or wound healing properties. Corsican honeys just began to be tested for their antimicrobial activity with promising results on Pseudomonas aeruginosa. So, identification of active molecules and their mode of action was determined. Hydrogen peroxide concentrations were evaluated and, in parallel, the minimal inhibitory concentrations (MIC) values were performed with and without catalase. More, the quantity of phenolic compounds and ORAC assay were measured. Observation of antibacterial action was done using scanning electron microscopy (SEM) followed by plasmidic DNA extraction. MIC values of chestnut grove and honeydew maquis honeys vary between 7% and 8%, showing a strong antimicrobial capacity, associated with a plasmidic DNA degradation. When catalase is added, MIC values significatively increase (25%) without damaging DNA, proving the importance of H2 O2 . This hypothesis is confirmed by SEM micrographies which didn't show any morphological damages but a depletion in bacterial population. Although, such low concentrations of H2 O2 (between 23 μmol.L-1 and 54 μmol.L-1 ) cannot explain antimicrobial activity and might be correlated to phenolic compounds concentration. Thus, Corsican honeys seems to induce DNA damage when H2 O2 and phenolic compounds act in synergy by a putative pro-oxidant effect. The biochemical properties of buckwheat honey, including contents of sugars, proteins, total phenols, methylglyoxal (MGO), minerals and phenolic compounds, were determined in comparison with those of manuka honey. Buckwheat honey has higher contents of sugars, proteins and total phenols but a lower content of MGO than manuka honey. Buckwheat honey contains abundant minerals involved in a number of vital functions of the human body as does manuka honey, and has even higher contents of Fe, Mn and Zn. In buckwheat honey, p-hydroxybenzoic acid, chlorogenic acid and p-coumaric acid are the dominant phenolic compounds. 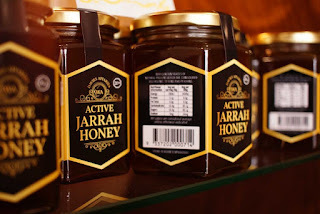 Moreover, the antibacterial and cellular antioxidant activities of buckwheat honey were compared with those of manuka honey. Buckwheat honey exhibits antibacterial activity against Staphylococcus aureus and Pseudomonas aeruginosa, comparable with manuka honey, and the cellular antioxidant activity of buckwheat honey is higher than that of manuka honey. Our results suggest that buckwheat honey has great nutritional and commercial potentials. Ventricular remodeling is associated with many heart diseases, and ventricular remodeling induced by hypertension can be fatal independent of hypertension. In this study, we prepared a novel apitherapy formulation, designated Bao-Yuan-Ling (BYL), which contained propolis, royal jelly, and bee venom, to treat spontaneous hypertensive rats (SHRs). We then evaluated the pharmacology of BYL and the potential mechanisms through which BYL affects hypertension and ventricular remodeling. Honey is a natural food item produced by honey bees. Ancient civilizations considered honey as a God gifted prestigious product. Therefore, a huge literature is available regarding honey importance in almost all religions. Physically, honey is a viscous and jelly material having no specific color. Chemically, honey is a complex blend of many organic and inorganic compounds such as sugars, proteins, organic acids, pigments, minerals, and many other elements. Honey use as a therapeutic agent is as old as human civilization itself. Prior to the appearance of present day drugs, honey was conventionally used for treating many diseases. At this instant, the modern research has proven the medicinal importance of honey. It has broad spectrum anti-biotic, anti-viral and anti-fungal activities. Honey prevents and kills microbes through different mechanism such as elevated pH and enzyme activities. Till now, no synthetic compound that works as anti-bacterial, anti-viral and anti-fungal drugs has been reported in honey yet it works against bacteria, viruses and fungi while no anti-protozoal activity has been reported. Potent anti-oxidant, anti-inflammatory and anti-cancerous activities of honey have been reported. Honey is not only significant as anti-inflammatory drug that relieve inflammation but also protect liver by degenerative effects of synthetic anti-inflammatory drugs. Honey is not food stuff only but a combination of many medicinally important chemicals either from plant or honey bee. Therefore, honey is used in drug manufacturing in modern medicinal companies. The combined effect of honey and plant extracts has opened a door for developing a safe and highly potent natural drug against contagious diseases like tuberculosis, tetanus, influenza, hepatitis and human immune deficiency syndrome. Beside these all, it will also overcome the serious problem of microbial resistance to synthetic antimicrobial drugs. Therefore it is still an open window for researchers to work on it and contribute to the science of this prestigious God gifted product. The commercial interest in honeydew honeys (from secretions of plants or excretions of plant-sucking insects on plants) is increasing due to the higher therapeutic properties than those of most blossom honeys (from nectar). However, honeydew honeys have been less studied than blossom honeys. In this work, studies carried out to characterize and authenticate honeydew honeys by botanical and geographic origins have been reviewed. The identification of the honey origin has been approached by two ways: chemical markers and development of analytical methodology combined with multivariate analysis. Some compounds have been suggested as specific botanical markers of several honeydew honeys: quercitol and trans-oak lactone for oak honey; 2-aminoacetophenone and propylanisol for holm oak; and 1-chloro-octane and tridecane for pine honey. 3-Carene and an unidentified compound in samples were proposed to discriminate between Greek and Turkish pine honeys. Chemometric analysis has been applied on chemical composition and physicochemical, microscopic, or spectra parameters and proved to be a valuable way for authenticating honeydew honeys. The analytical methods based on spectra information are suitable for the routine control of the honeydew honeys origin because they are fast and require an easy sample preparation. A novel facultatively anaerobic, Gram-stain-positive, non-motile, non-spore-forming, catalase-negative bacterium of the genus Lactobacillus, designated strain Bb 2-3T, was isolated from bee bread of Apis cerana collected from a hive in Kunming, China. The strain was regular rod-shaped. Optimal growth occurred at 37 °C, pH 6.5 with 5.0 g l-1 NaCl. The predominant fatty acids were C18 : 1ω9c, C16 : 0 and C19 : 0 iso. Respiratory quinones were not detected. Seven glycolipids, three lipids, phosphatidylglycerol and diphosphatidylglycerol were detected. The peptidoglycan type A4α l-Lys-d-Asp was determined. Strain Bb 2-3T was closely related to Lactobacillus bombicola DSM 28793T, Lactobacillus apis LMG 26964T and Lactobacillus helsingborgensis DSM 26265T, with 97.8, 97.6 and 97.0 % 16S rRNA gene sequence similarity, respectively. A comparison of two housekeeping genes, rpoA and pheS, revealed that strain Bb 2-3T was well separated from the reference strains of species of the genus Lactobacillus. The average nucleotide identity between strain Bb 2-3T and the type strains of closely related species was lower than the 95-96 % threshold value for delineation of genomic prokaryotic species. The G+C content of the genomic DNA of strain Bb 2-3T was 37.4 mol%. On the basis of phenotypic, chemotaxonomic and phylogenetic analyses, strain Bb 2-3T is proposed to represent a novel species of the genus Lactobacillus, for which we propose the name Lactobacillus panisapium sp. nov. The type strain is Bb 2-3T (=DSM 102188T=ACCC 19955T). Honey is the product of beekeeping that has great market potential thanks to valuable nutritional and medicinal qualities. Black Sea Region coast of Turkey is suitable for production of chestnut production so chestnut-based honeys are highly produced in this region. To prove the beneficial therapeutic properties, 49 chestnut (Castania sativa Mill.) honey samples from the cities of Black Sea Region were investigated in terms of colors, total phenolic and flavonoid contents, antioxidant activities, antimicrobial potentials, phenolics, and effects on hydroxyl radical-induced DNA breaks in the non-site-specific system. The amount of flavonoid was found to be limited in chestnut honey samples compared to the phenolic acids. A wide variation was observed in the amounts of total antioxidant activities of honey samples. It was displayed that most of the tested honey samples had the ability to repair the DNA breaks created by hydroxyl radicals. As the chestnut honey (CH) is one of the most popular and valued honey around the world, the objective of this study was to reveal the potential of the Black Sea Region where CH production is being carried out effectively. Actually, CH samples investigated in this study had superior properties in terms of the parameters examined when compared with the results of similar studies. Antioxidant and antimicrobial activities of the CH samples at effective levels could be attributed to the presence of phenolic substances at a significant level. The high phenolic contents of the samples are predicted to contribute to the ability to resist DNA damage. With all these determined features, CHs can be useful in various applications such as medicine, cosmetics, and food. In this way, CH production in this region contribute to both the region's and the country's economy. Propolis, a resinous substance produced by honeybees, possesses various biological actions including anticancer activity towards tumor cells. Recently, the ethanol extract of Brazilian green propolis has been shown to induce autophagy, which is known to be induced in treatment of cancer cells with anticancer drugs, leading to cancer cell survival and decreased sensitivity to anticancer agents. In this study, we aimed to identify autophagy-inducing components of the propolis and elucidated the reciprocal relationship between anticancer cytotoxicity and protective autophagy in prostate cancer CWR22Rv1 cells. Among eight cinnamic acid derivatives [chlorogenic acid, p-coumaric acid, caffeic acid, 3,4-caffeoylquinic acid, artepillin C (ArtC), baccharin, drupanin and caffeic acid phenethyl ester] in propolis, only ArtC showed high autophagy-inducing activity accompanying LC3-II upregulation. ArtC was also induced apoptosis as revealed by DNA fragmentation and increases in cleaved caspase-3 and poly ADP-ribose polymerase. The apoptosis induced by ArtC was exacerbated by cotreatment with autophagy inhibitors (chloroquine, wortmannin and U0126). The cotreatment further induced necroptosis accompanying increased expression of receptor-interacting serine/threonine protein kinases 1 and 3. These data indicate that cytotoxicity of ArtC to the prostate cancer cells is dampened by induced autophagy, but is markedly augmented by inhibition of autophagy. Therefore, the combination of ArtC and autophagy inhibitors may be a novel complementary-alternative treatment for prostate cancer. The opportunistic pathogen non-typeable Haemophilus influenzae (NTHi) plays an important role in many chronic respiratory diseases including otitis media, chronic rhinosinusitis, cystic fibrosis and chronic obstructive pulmonary disease. Biofilm formation has been implicated in NTHi colonisation, persistence of infection and recalcitrance towards antimicrobials. There is therefore a pressing need for the development of novel treatment strategies that are effective against NTHi biofilm-associated diseases. SurgihoneyRO is a honey-based product that has been bioengineered to enable the slow release of H2O2, a reactive oxygen species to which H. influenzae is susceptible. Treatment of established NTHi biofilms with SurgihoneyRO significantly reduced biofilm viability through enhanced H2O2 production and was shown to be more effective than the conventional antibiotic co-amoxiclav. 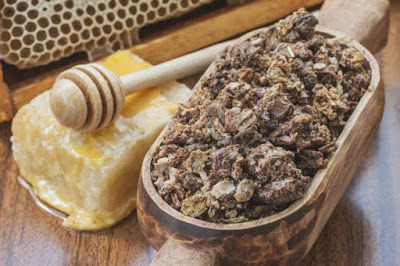 Propolis is a natural adhesive resinous compound produced by honeybees to protect hives from bacteria and fungi, being extremely expensive for food industry. During propolis production, a resinous by-product is formed. This resinous waste is currently undervalued and underexploited. Accordingly, in this study the proximate physical and chemical quality, as well as the antioxidant activity, radical scavenging activity and cell viability of this by-product were evaluated and compared with propolis in order to boost new applications in food and pharmaceutical industries. The results revealed that the by-product meets the physical and chemical quality standards expected and showed that the propolis waste contains similar amounts of total phenolic content (TPC) and total flavonoid content (TFC) to propolis. Also, a good scavenging activity against reactive oxygen and nitrogen species (ROS and RNS, respectively) determined by the assays of superoxide anion radical (O2-), hydrogen peroxide (H2O2), hypochlorous acid (HOCl), nitric oxide (NO) and peroxyl radical (ROO) were determined. Linear positive correlations were established between the TPC of both samples and the antioxidant activity evaluated by three different methods (DPPH, ABTS and FRAP assays). The extracts were also screened for cell viability assays in two different intestinal cell lines (HT29-MTX and Caco-2), showing a viability concentration-dependent. Similarly, the Artemia salina assay, used to assess toxicity, demonstrated the concentration influence on results. Finally, the antifungal activity against ATCC species of Candida was demonstrated. These results suggest that propolis by-product can be used as a new rich source of bioactive compounds for different areas, such as food or pharmaceutical. Delayed healing and non-union of fractures have a significant effect upon patient morbidity. Studies have therefore largely concentrated on accelerating fracture healing. This study was intended to compare the effect of "mad honey" and propolis on fracture healing using radiological and histopathological analysis. Femur fracture was surgically performed on 48 rats, followed by fixation. Animals were then divided into eight groups; two control groups (15- and 30-day) and six treatment groups (15- and 30-day normal honey, 15- and 30-day "mad honey" and 15- and 30-day propolis). Rats were sacrificed at the end of these periods, and radiological and histological examinations performed. 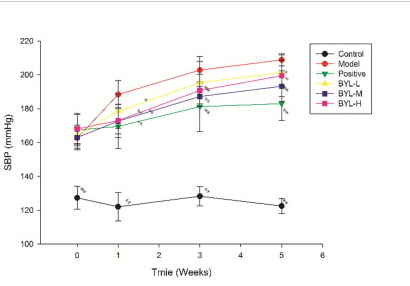 Radiological healing in the propolis group after 15-day therapy was statistically better than in the control (p = 0.004) and normal honey (p = 0.006) groups. After 30-day therapy, healing in the propolis group (p = 0.005) and grayanotoxin-containing 'mad honey' group (p = 0.007) were significantly better than in the control group. Histologically, there was a statistically significant difference between the 15-day propolis group and the other groups (control, honey, mad honey; p = 0.003, p = 0.003 and p = 0.002, respectively). We also found a statistically significant difference when the 30-day propolis group (p = 0.005) and "mad honey" group (p = 0.007) were compared to control group. This study shows that grayanotoxin-containing "mad honey" and propolis can accelerate fracture healing. TREATMENT OF ULCER: Research shows that treatment of disorders such as ulcers and bacterial gastroenteritis can can be aided with honey. REDUCE RISK OF HEART ATTACKS: Honey contains antioxidants that have been linked to reduced risk of heart attacks and strokes. They may also promote eye health. PREVENTS CANCER; Honey Prevent cancer and heart disease. It contains flavonoids, antioxidants, and carcinogen-preventing properties and can help fight the growth of existing tumors, cancers and heart disease. TREATS COUGH: It reduces a cough and throat irritation. The honey keeps the throat calm by soothing the nerve endings that protect the throat. Some doctors believe that two tablespoons of honey are just as effective as cough medicine. TREATING HANGOVER: Honey helps your liver speed up the oxidation of the alcohol, which helps get the toxins out of your body faster. That headache you feel is caused by the liver’s inability to process all of the toxins from the drinks you quickly consumed. It takes time, but honey can help speed up that process. REDUCE ALLERGY: Because of honey’s anti-inflammatory properties, it is able to help reduce allergy symptoms. It acts as a natural vaccine because it contains little amounts of pollen. TREATMENT FOR WOUNDS AND BURN: Because of its natural antibiotic nature, honey can help soothe and treat wounds and burns. Our recent research indicated that honey active macromolecules form colloidal particles that scatter the light and produce elaborate UV spectral profile dominated by double absorption peaks at 240-250 nm. The absorption at 240-250 nm signified the stable honey conformation that supported antibacterial activity and hydrogen peroxide production. Our aim was to identify the bioactive constituent relevant to this absorption. The methodology included activity-guided fractionation of honey through size-exclusion chromatography, solid-phase extraction and UPLC-UV-MS. UV spectral analysis of UPLC peaks revealed compounds with UV λ (max) typical of naphtoquinones. The MS chromatograms showed mass ions differing by [M-68n] indicating a polyisoprene structure and the fragmentation patterns typical for menaquinones. The exact mass measurements of menaquinones using a quadrupole-Orbitrap mass spectrometry confirmed their identification as a series of MK-3 to MK-7 aptimers. Detection of menaquinones, previously unknown constituents of honey, suggests that they might play role in honey redox and antibacterial activities. Besides honey, honeybees make a sticky substance (called propolis/bee glue) by mixing saliva with poplar tree resin and other botanical sources. It is known to be rich in bioactivities of which the anticancer activity is most studied. Caffeic acid phenethyl ester (CAPE) is a key anticancer component in New Zealand propolis. We have earlier investigated the molecular mechanism of anticancer activity in CAPE and reported that it activates DNA damage signaling in cancer cells. CAPE-induced growth arrest of cells was mediated by downregulation of mortalin and activation of p53 tumor suppressor protein. When antitumor and antimetastasis activities of CAPE were examined in vitro and in vivo, we failed to find significant activities, which was contrary to our expectations. On careful examination, it was revealed that CAPE is unstable and rather gets easily degraded into caffeic acid by secreted esterases. Interestingly, when CAPE was complexed with γ-cyclodextrin (γCD) the activities were significantly enhanced. In the present study, we report that the CAPE-γCD complex with higher cytotoxicity to a wide range of cancer cells is stable in acidic milieu and therefore recommended as an anticancer amalgam. 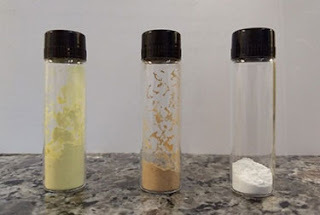 We also report a method for preparation of stable and less-pungent powder of propolis that could be conveniently used for health and therapeutic benefits. Manuka honey from New Zealand is imported to the U.S. by Pennsylvania-based Wedderspoon Organic Holdings. It was responsible for 73% of the combined growth of the Manuka category last year at conventional grocery, natural and specialty stores, according to Food Navigator. The products are carried by Publix, Sprouts, CVS and Natural Grocers outlets, the site reported. The Manuka bush — related to the tea tree — only grows in New Zealand and imparts a distinctive flavor and potential health benefits to the honey, according to the company. The latter includes antibacterial activity, which Manuka honey seems to provide even at low concentrations. SHENZHEN, Feb. 9 (Xinhua) -- Most people run in the opposite direction at the sight of bees, but a few patients in China are volunteering to be stung. It is a cold morning and She Ruitao is wearing a hat with a veil and two pairs of gloves. He is going to catch live bees on an isolated hill in the southern Chinese city of Shenzhen. He has raised these bees himself. With a pair of forceps he takes them from their hive and puts them into a glass bottle. Half an hour later, he and 100-plus bees are in his consulting room at Shenzhen Traditional Chinese Medicine (TCM) Hospital. Catching bees is his first job every Monday, Wednesday and Friday. Since last March, he has been offering bee sting therapy to outpatients at the hospital three times a week. Part natural medicine, part acupuncture, the therapy requires doctors to inject bee venom into points on the patient's body through a live sting. "Not all patients can be treated with the therapy," he explained. It is considered a valid treatment for various ailments, in particular, arthritis and rheumatism. Patients need to have X-rays and blood tests before he offers treatment. Zhan has suffered from arthritis for years. She holds a bee in forceps and uses it to "sting" Zhan on points on his leg. "My swelling has gone down and my pain has lessened," Zhan said. 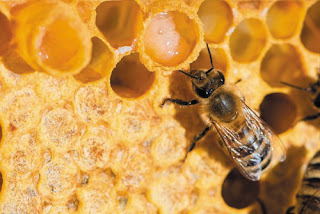 A hydrophilic interaction liquid chromatography tandem mass spectrometry (HILIC–MS/MS) method to separate and quantify the polar bioactive molecules present in royal jelly has been developed by researchers from the Aristotle University of Thessaloniki, in Greece (1). WATCH: Why is Manuka honey more effective than regular honey? 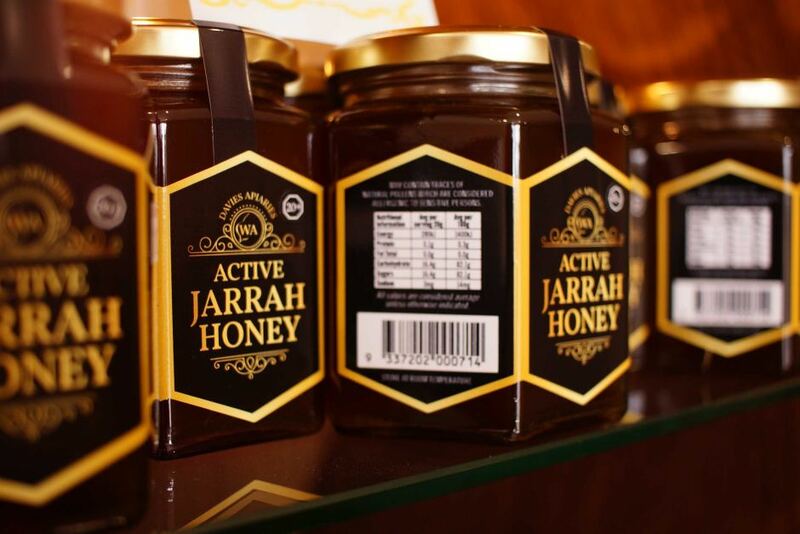 • Honey is proven to have strong anti bacterial action against all bacteria obtained from diabetic foot ulcer. • Inhibitory effect of honey was concentration dependent. • It is bactericidal on both gram negative and gram positive bacteria. • It has both hydrogen peroxide and a non peroxide component. Caffeic acid phenethyl ester (CAPE) is a key anticancer component in New Zealand propolis. We have earlier investigated the molecular mechanism of anticancer activity in CAPE and reported that it activates DNA damage signaling in cancer cells. CAPE-induced growth arrest of cells was mediated by downregulation of mortalin and activation of p53 tumor suppressor protein. When antitumor and antimetastasis activities of CAPE were examined in vitro and in vivo, we failed to find significant activities, which was contrary to our expectations. On careful examination, it was revealed that CAPE is unstable and rather gets easily degraded into caffeic acid by secreted esterases. Interestingly, when CAPE was complexed with γ-cyclodextrin (γCD) the activities were significantly enhanced. Could bee glue (propolis) reduce infections on replacement joints? Hydroxyapatite (HA), a mineral naturally found in bone, is used therapeutically to replace bone and to coat prosthetics, but can become infected once in the body. Eliana Cristina da Silva Rigo and her research group have investigated antibacterial compounds from propolis, a bee product used in traditional medicine, transferred onto HA. Rigo and her team extracted antibacterial compounds from red and green Brazilian propolis, applied it to HA, and evaluated the antibacterial activity (Biomed. Mater. 13 025010). The honeybee and hive products have historically played a large role in disease care and prevention. Today science is finally catching up to what beekeepers, naturalists, herbalists, and acupuncturists have known for years. Join local beekeeping expert Ross Conrad to learn about the production, harvesting, uses and healing properties of honey, pollen, propolis, and honey bee venom. To register for classes, contact Denise Senesac at the Hannaford Career Center by calling (802) 382-1004, or emailing dsenesac@pahcc.org. Classes are capped at 12 participants and will be filled on a first-come, first-served basis. Please register for classes at least one week in advance of the class date.All classes are $30 or free for members of the Co-op’s Food For All Program. Major royal jelly protein 1 (MRJP1) is the most abundant protein in royal jelly (RJ), and the level of MRJP1 has been suggested as a promising parameter for standardization and evaluation of RJ authenticity in quality. Here, a quantitative method was developed for the quantification of MRJP1 in RJ based on a signature peptide and a stable isotope-labeled internal standard peptide FFDYDFGSDER*(R*, 13C6, 15N4) by ultraperformance liquid chromatography–tandem mass spectrometry. Recoveries of the established method ranged from 85.33 to 95.80%, and both the intra- and interday precision were RSD < 4.97%. Quantification results showed that content of MRJP1 in fresh RJ was 41.96–55.01 mg/g. Abnormal levels of MRJP1 were found in three commercial RJs and implied that these samples were of low quality and might be adulterated. Results of the present work suggested that the developed method could be successfully applied to quantify MRJP1 in RJ and also could evaluate the quality of RJ.